I love the idea of having everything I need for a certain project in a single place. Perhaps that is why I like box-sets or the complete collection of this or that. For example, I have almost all of the EC Comics that were produced in the mid-1950s. These were the horror comics with illustrations by great artists like Jack Davis, Wally Wood, and Frank Frazetta, that appeared as a series entitled "Tales from the Crypt," "The Vault of Horror," "The Haunt of Fear, "Weird Science," "Crime SunspenStories," and so on. As a teenager, they scared the bejesus out of me. The EC Comics would later inspire all kinds of magazines that somehow riffed off of them and carried the torch forward, like Marvel Comics and especially Mad Magazine, which we all dutifully read. Back in the late 1950s I would hitchhike to New York City with my friend Doug Fontaine Brown (artist and musician) and we would sleep on the floor at Larry Ivy's apartment during our stay there. Ivy was a brilliant comic illustrator who worked with (and often drew for) illustrators like Frank Frazetta. But I digress. What I started out to say is that there is something wonderful about having a collection or toolbox that contains all that we need for a certain undertaking. And for me, the most wonderful toolbox of all is the set of methods the Tibetan Buddhists offer us for fine-tuning our mind. Nothing like that exists here in the West. I spent many years trying to piece together a collection on my own psychological tools before I discovered the Tibetan toolbox, and didn't get much of anywhere but lost. Now that I have found them, I am so grateful because they actually work! I want at least to tell you something about them and draw you a rough map. Every box of tools has a use and with Tibetan mind training the use or goal, at least initially, is to recognize for ourselves the true nature of the mind. After that there is the road to enlightenment to travel, but that road really starts with what is called "recognition." In Zen Buddhism, it is called "Kensho." Anyway, that is the first real stop on the road to full awareness, and the Tibetans have special tools to get there. As mentioned here, I include a map of some mind-training tools if you want to sing along. On this map are many of the common tools used by the Tibetans to train the mind arranged in a diagram that reads from top (beginning) down. Let's start with our intent or what the Tibetans call our "aspiration." Every mind practice that we do, no matter how small, should begin with some kind of aspiration. What are yours? What is the reason you are practicing the dharma or thinking of practicing? This is very important because our aspiration sets our sails toward as to where we want to go. It is traditional to aspire to reach enlightenment in order to benefit all sentient beings, including yourself. In my case, every time I learn something dharmic, I want to share it with others, which is what I am attempting to do right here. Anyway, aspirations are important to signify where we intend to head. Next, we have to set the tone or mood for the practice and this usually involves the Four Thoughts. I have written about the "Four Thoughts That Turn the Mind to the Dharma," so I won't repeat much here, but they are the place to start. No, it's not exactly a meditation technique, but contemplating these thoughts sets the stage and puts us in the right mood for working with the dharma. They involve remembering that this life we are living is precious and should not be wasted. And life is so impermanent. As the great meditation master Ven. Bokar Rinpoche once told me when I said goodbye to him at his monastery at Mirik in West Bengal, India: "Michael, tomorrow or next life, whichever comes first." That was sobering and unfortunately it was not long before Rinpoche passed away. And there is the third thought, the one about karma, and the fact that our every action (no matter how small) has direct consequences for us. And finally, the thought that no matter how hard we try, we will never get our ducks all in a row. We can't game the system. Those thoughts are for openers and should be invoked before every practice unless we are already in that mood. And now for the actual practices, and they can be different depending on where we are in our training. The first form of dharma practice that was pointed out to me by my Tibetan lama is what is called Tong-Len. This was before I started real sitting-meditation practice. Tong-Len is something that we can do anytime and anywhere. It does not require sitting on a cushion, and it is extremely appropriate for Americans, so I have been told by the Tibetans. Basically Tong-Len is a way of coming to terms with our ingrained dualistic notions, our biases, prejudice, likes, and dislikes. Through Tong-Len we begin to resolve the various dualities that our sense-of-Self supports, the "we" and the "them" component. This practice is easy to learn very effective. However, not everyone is ready to begin. This was certainly true in my case. I found it very difficult to simply meditate in the beginning, and not even just in the beginning. It was hard for me to concentrate, much less meditate. Luckily, the Tibetan toolbox contained some remedies for my failure to start well. Chief among them are the Extraordinary Preliminaries, what is called "Ngondro," and it amounts to something like a dharma book camp. If our mind is too obscured, distracted, busy, or whatever you want to call it, then we need to first remove the obscurations before we can move forward. Ngondro is designed to do just that, but it is not for the faint of heart. It is for those who grasp that there is work that has to be done by us before we can even learn to meditate. It is like getting in shape. When I first heard about the Ngondro, I freaked. There was no way, so I thought, that I am ever doing that, period, end of story. Well, there was "way," but it took me some time to get around to it. In fact, when I finally was willing to do it, my teacher, a Tibetan rinpoche, told me I was not yet ready for that, and started me out on something simpler, which was the practice of Tong-Len. We have to get permission to do Ngondro, receive the lung (reading transmission), and get formal instruction on how to do it, and also it helps to have a guide, someone with experience who can help keep us on track. Ngondro is not an easy practice. It consists of five separate practices, only two of which can be done concurrently. Ngondro is designed to prepare the mind for learning meditation properly and more easily. I call it the "Dharma Boot Camp," because it is a series of intense practices that limber up our body, including our emotional body, and help to clear away some of the worst of our obscurations so that we can see clearly well-enough to undertake learning basic meditation. Another strong, but easier, remedial practice are the Seven Points of Mind Training, which is an advanced form of Tong-Len that helps us to develop a strong Bodhicitta, which is our desire or heart for enlightenment, and also trains us in compassion. I would do another ngondro." And so I did. After completing Ngnodro, many practitioners, at the suggestion of their teacher, will undertake what is called Deity Practice. A particular meditation (deity with certain qualities) or Yidam is selected for which the student has identified or has a need to identify with. This deity then becomes the focus of a special practice that I can't go into here. In addition, after undergoing the ngondro, we then go back to (or begin) to learn sitting meditation, often along (as mentioned) with some form of Deity Practice. I did a number of deity practices for years. As I pointed out, after we have removed some of our obstacles and obscurations through the remedial practices, we are ready to learn basic sitting meditation which, in a few words, is learning to allow our mind to rest naturally in one-pointed concentration. The most common form of sitting meditation is called Shamata, and Americans easily confuse it with the scores of what relaxation techniques that pass for meditation here in America. Relaxation techniques masquerading as "meditation" are just that, one or another ways to relax. Nothing wrong with relaxing, but it is not the meditation that Buddha did. Actual Shamata meditation is a technique to relax, alright, but relax in a concentrated form, which must be some kind of oxymoron. Or perhaps a better description would be to allow the mind to rest mindfully, as in: rest in mindfulness. Anyway, Shamata meditation is not considered any kind of end-result by itself, but necessary to learn before we can undertake what is called Vipassana or Insight Meditation. Once we can allow our mind to rest mindfully (Shamata) we can begin to learn Insight Meditation, which essentially has to do with turning the mind away from always looking outward, as we do normally, and learning to train the mind to look inward at its own nature. There are many methods to do this, which I will not go into here. Suffice it to say that at this stage, at least in Vajrayana Buddhism, we need to be working closely with a teacher, someone who has mastered Insight Meditation and can introduce us to it. And here we come to a natural impasse or landmark in meditation training, what is called "Recognition." Recognition means recognition of the true nature of the mind, something we have never done up to that point due to our generally ignoring the mind itself, basically having been distracted by the outer world, and obscured by the filter of our own accumulated karma. It is clearly said by the great Mahasiddhas that we cannot point out to ourselves the true nature of the mind, and that it requires a teacher or guru to achieve this. And there is no wiggle room here. For years I thought I was clever enough to figure all this out for myself, and was brilliant at rationalizing away statements like the above sentence or two. Trust me, when the great Mahasiddhas tell us that we absolutely need an authentic teacher to point out the nature of the mind, they are not leaving any room to wiggle in. We either have seen the true nature of our mind or we have not, and until we have, we cannot successfully learn any of the more advanced forms of meditation, and why is that? This is true because until we see how the mind works, we obviously cannot work it.. As they say, period, end of sentence. Words cannot successfully describe what recognition is, so I am not going to spend many here attempting it. One thing I can say is that recognition is NOT enlightenment or anything close to it. However, it is the point in our training where several things happen. Once we have attained recognition and seen how the mind works, we can from that point on work the mind by ourselves. We see how it works. It is said that the guru's job is done the moment we achieve recognition of the mind's true nature. At that point we, ourselves, become responsible for our own enlightenment and intuitively know how to go about that. It is also the point where we are no longer "practicing" or trying to meditate, but begin to actually meditate without trying. And lastly, we suddenly have an inexhaustible drive and enthusiasm for dharma because we finally see how anyone could do it. And our compassion to share this knowledge with others increases proportionately. Recognition is a hard-coded event, with a distinct before and after. After recognition the student often begins to learn (depending on which lineage you are in) Mahamudra, Dzogchen, or Maha-Ati Meditation, which are the highest form of meditation in the various lineages of Tibetan Buddhism, and the road to our eventual enlightenment. Mahamudra Meditation is a combination of both Shamata and Insight Meditation in a unique recursive engine that fuels us toward enlightenment. It is like one of those warp drives in a Star Trek movie, where our hyper drives forces us on till morning and enlightenment. And finally, at the bottom of the map, notice the need to dedicate the merit of any practice we do. This happens at the close or every practice or at the end of our day. We dedicate whatever merit we have accumulated, however small, to all the Buddhas and Bodhisattvas that they may use it to benefit and bring to enlightenment all sentient beings in the three times, the ten directions, and the billions of worlds. 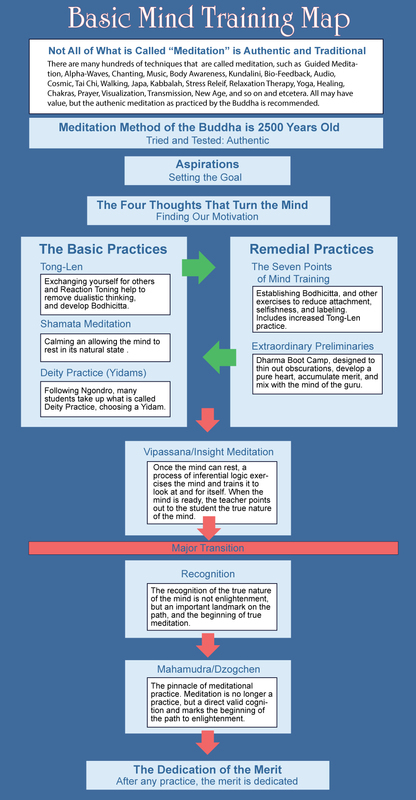 So, there you have a rough map of some of the standard meditation practices as used in the Kagyu Lineage. Of course, there are other maps and ways to combine all of this, but at least you have one for reference sake. If you have read all the way down to here, please join me in dedicating any merit from reading this work to benefit all sentient beings, so that each may awaken to the full awareness that Buddha had. May we all awaken!